Target may launch its own mobile wallet as soon as next year, according to a report out this morning from Reuters, citing unnamed sources. The move would put the fourth-largest U.S. retailer in direct competition with other payment platforms, including Apple Pay, Android Pay, and Samsung Pay, for example. It also follows a similar move from Walmart involving the introduction of its own mobile payments service, Walmart Pay, as a feature within its own smartphone application in the first half of 2016. What’s interesting about this report is that, like Walmart, Target is also a member of a retailer-backed consortium MCX which is developing a mobile wallet to compete with the likes of Apple Pay, called CurrentC. That app has not yet launched, but has been criticized for being a clunky solution in comparison with the NFC-based tap-and-pay efforts from Apple, Google and others. In addition, during its beta, it hasn’t allowed users to pay with credit cards – instead only permitting payments with gift cards, store cards, or through a direct connection with a user’s bank account. It’s possible that Target believes it can develop a more elegant solution in-house, rather than through this joint effort. That’s certainly believable given that Target has already rolled out a suite of beautifully designed mobile applications that are also innovative from a technical perspective. 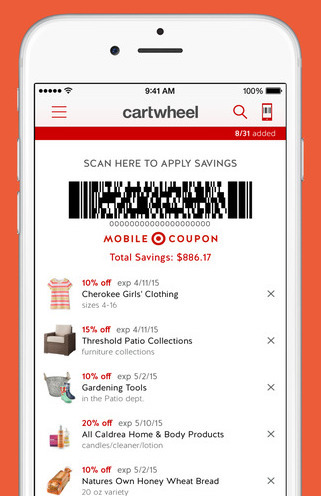 For example, Target’s mobile couponing app Cartwheel is a top 10 app on the App Store today, and sees heavy usage from consumers who tap to add items to their savings list then scan a barcode at checkout. The company’s flagship app also introduced its own in-store item locator, and uses beacon technology to ping consumers about in-store deals, trends and recommendations. Outside of mobile, Target has been open to trialing new means of reaching its customers, whether that’s through on-demand grocery deliveries or curbside pickups – further indicators that the company is not slow to embrace new technology and services. According to Reuters’ report, Target has been in discussions with credit card companies for its mobile wallet and is considering using scanning technology to link the wallet to point-of-sale transactions. That makes it sound like the payments process could actually be integrated within Cartwheel, though the wallet has not actually moved to the point of testing, the articled notes.